As a painter, I often do not like to contemplate having any sort of illness associated with my eyesight. That’s why, when I discovered a long while back that Claude Monet (one of my Heroes of Art History) had suffered from cataracts, it gave me the willies. I learned that fact at a massive retrospective of Monet’s work that I saw at the Art Institute of Chicago in the 1990s, I believe. They had his works arranged in chronological order by date, and one room was dominated by a decidedly, predominantly warm palette. When I read the blurb printed on the wall, it was one of those epiphany moments of art history that I experience (often on a daily basis). I remember when I proceeded to the next room, post-cataract surgery (1922), that his palette had returned to the predominant blues, greens, and violets. How they cured cataracts in the 1920s without zapping them with a laser is another topic I don’t care to contemplate. In 1893 Monet began to transform the marshy ground behind his house in Giverny into a Japanese garden with a water lily pond and various domestic plants. He also built a "Japanese" wooden bridge. The point to the garden was to contrast two ideas that were central to his work after the 1880s: the gradual dissolution of floral forms, and reflections in water. He explored the subject of the pond and the bridge 18 times between 1898 and 1900. 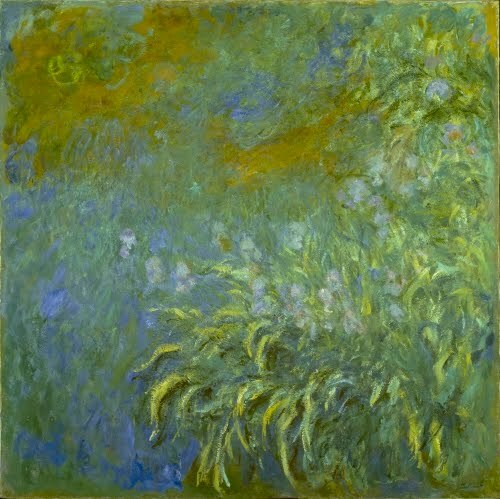 It appeared less frequently after he was diagnosed with cataracts, when the pond and water lilies occupied the majority of his work towards the end of his life. 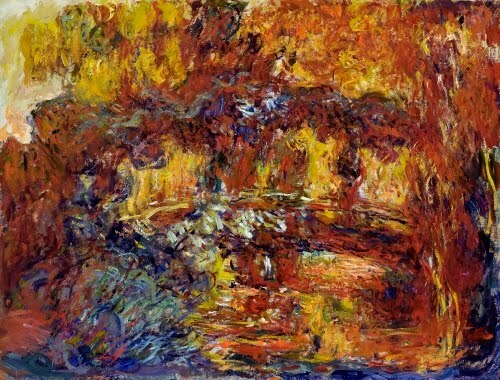 Monet began having trouble with cataracts in 1905, but did not see a doctor about it until 1912. He put off the needed surgery until 1923. 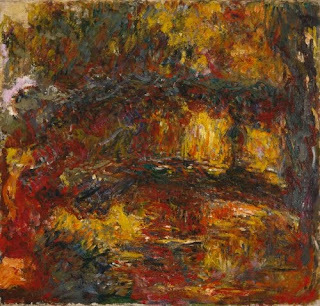 Cataracts affected his ability to distinguish the cool range of colors, thus many of his works from this period are dominated by bright yellows, oranges, purples, and reds. His brush strokes also became wider and larger because cataracts cause light to blur the contours of objects. These warm paintings were not Monet's intentional stylistic shift; he was merely painting what he saw with the cataracts. This is borne out by the fact that after he had the surgery in 1923, he destroyed many of the orange/yellow works. I’m glad Monet didn’t destroy all of these paintings from the Cataracts Period. I’m just wondering why he waited 18 years to get the condition fixed? I find these paintings in a warm palette with gestural brush work to be very visually exciting, sort of like Expressionism, which was being explored at the same time. One of the paintings I saw in the AIC exhibit was a painting of Monet’s house in Giverny, and I am ashamed to admit as an art historian, that my first reaction to it was that it was a van Gogh!